Choose the perfect balance between privacy and light at any moment of the day. An endless chain allows you to slide the transparent and opaque woven sections past each other to open partially open or fully close the shade. The high quality and light weight Trevia CS fabric is a unique and patented design. A diverse range of colour options have been chosen to enhance your living space and reflect current trends. Available in three vane widths and a range of contemporary and diverse colours – and even in up-to-date trend tones – Facette® Shades are designed to blend in harmoniously with your style and furnishings. With its new vane widths, Facette® Shades now offer you more possibilities than ever before. Will you select the ultra-slim 4 mm (S) vane, the popular 7 mm (M) vane or the dramatic new 14 mm (L) option? Consider the proportions of each window you are dressing, and simply choose the width that best balances the overall effect. 16 main colours plus 1 trend colour. The collection will regularly be updated with one or more colours that reflect the latest fashion and design trends. 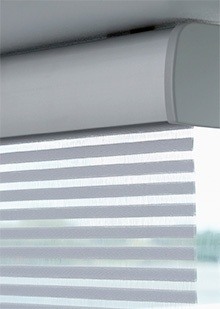 The innovative Facette® Shades fabric is made of high quality fire-retardant 100% Trevira CS yarns for peace of mind. Small (4 mm): slim elegance for even clearer view-through. 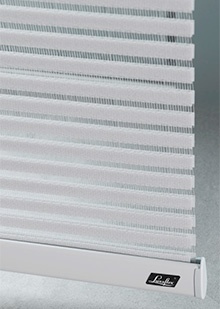 Medium (7 mm): suitable for almost every size and shape of window. Available in 16 attractive colours. Large (14 mm): a strong, spacious style for larger windows. Available in 6 attractive colours.